The kit costs €180 and includes a C7 NFC phone as well as a selection of NFC tags. 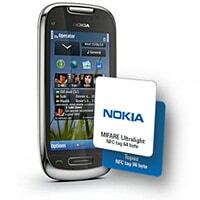 Nokia has launched a kit that provides developers with a low-cost way to obtain an NFC phone and a selection of tags to experiment with. …and a special offer voucher for NFC products from the Top Tunniste online store. The Device Kit is available to all Nokia Developer Pro and Launchpad program members. For those who don’t already have a membership, Nokia is also offering a free one year subscription to Nokia Developer Launchpad.